This coffee will be fresh roasted for you. 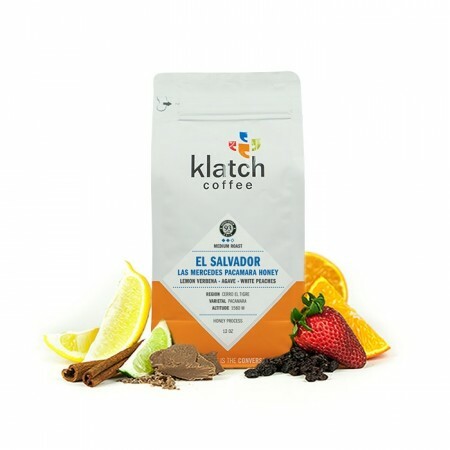 We expect Klatch Coffee Roasting will roast and ship this coffee in 1-2 business days depending on their roasting schedule. The El Salvador Las Mercedes Pacamara Honey was carefully roasted for you by Klatch Coffee. Grown by the Lucia Abregado De Ortiz in the Cerro El Tigre region at 1,560 meters, this honey processed and Rainforest Alliance certified coffee is a perfect example of why we love coffees from El Salvador. This coffee has notes of white peach and lemon with an agave-like sweetness. I was not a fan of this coffee. The roast level is fine, but I don't like the strong lemon. I also got a lot of lemongrass on this profile.